Having a great pizza shop naturally means that you should have great pizza. However, you might find that you want to offer more than just pizza on your menu. If your kitchen is large enough, and you have the employees who will be able to handle making different types of foods, then expanding your offerings could be a good idea. You might want to start out slowly as it can take some time for customers to realize that you are now offering other items, and it may take some time for these new items to start selling. You do not want to add too many items at once and then face the financial losses if they don't go over well. Instead, it makes sense to add just a few items at a time and see how well they do. You can start adding more items to your menu as they begin to sell. Of course, you might be wondering just what types of items you should add to your pizza menu. Fortunately, the list is long. However, by keeping it simple in the beginning, you will be able to gauge what works and what doesn’t work. Here are some foods that you might want to consider adding to your pizza menu. If someone loves pizza, chances are that they are going to love calzones as well. These are almost as versatile as pizza and you can create quite a few different types. Simple cheese calzones, pepperoni, and sausage and mushroom calzones are easy to make and they are popular. However, you can always look for different types of calzones that are a bit different. Chicken Cordon Blue calzones are a tasty example. 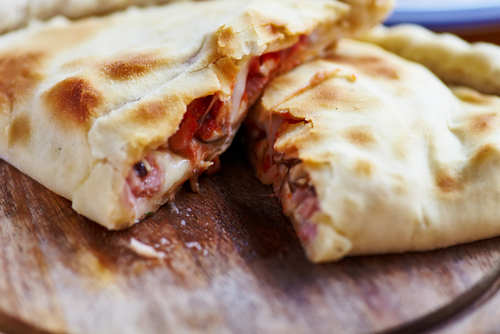 If calzones prove to be popular in your shop, start thinking outside the box by creating some new and unusual calzones. Dough, sauce, and meat are great, but sometimes people just want to have a nice salad. One of the mistakes that many pizza shop owners make is that they don’t offer salads, or that the salads that they do offer are underwhelming. You should try to create salads that are actually appealing and that are filling in their own right. Good choices are chef salads, caeser salads and greek salads, as they are easy to prepare and healthy too. Another items that many pizza shops offer are sandwiches. Sandwiches are even more versatile than pizza, and they are an easy addition for most shops. Submarine sandwiches, or hoagies, are quite popular and they are easy to make. You could start with a few different types of sandwiches and then add to the menu over time. You can also invest in a panini pressand offer toasted sandwiches to your customers. Consider offering dessert on your menu in addition to other items. You can choose different types of desserts that are popular in pizza places. Dessert pizzas with sweet toppings are a popular and creative option Other dessert options include simple to store and sell items such as éclairs or cannoli. You could also offer fresh baked cookies.or even ice cream. As you can see, you have quite a few different options when it comes to adding new items to your menu. Choose wisely and go slowly when adding new items to your pizza menu, and will be certain to find successful choices that everyone will enjoy.